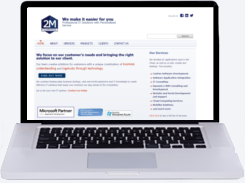 share field: Is your Website "Mobile Ready" - if not, make it happen...contact 2M! Don't pass-up providing an enjoyable browsing experience to potential customers...Is your website ready? Research company ‘eMarketer’ estimates that 73.4% of worldwide Internet users accessed the Web from a mobile device in 2013. They predict that number rises to 79.1% percent by the end of 2014 and climbs to 90.1% in 2017. What we do, is by making your website mobile, we make it automatically re-size the display to fit whatever device you are viewing the website on (PC, laptop, tablet or mobile phone). Is your website ready? If you browse to your own site off your phone – do you like what you see? How about off your tablet? Think of how often you use your phone or tablet to access the web – you’ll experience the trend first hand. The Mobile Web and The Cloud are revolutionizing life and business as we know it today!